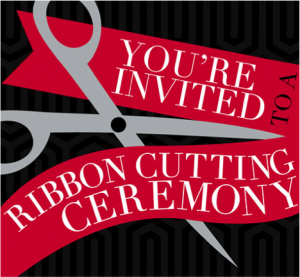 A ribbon cutting or grand opening celebration is a great way to let the world know that you are open. It’s a way to bring family, friends, contractors, bankers, and customers to your new facility and thank them their support. The event is also a way for community officials to welcome you to town and to thank-you for doing business in Scarborough. The Ribbon Cutting can be an opportunity for a press release – but many times it will be up to you to supply the image and press release to the local papers. Doing a ribbon cutting or grand opening can be scheduled for new facilities or expanded facilities. You could even do an event to christen a new piece of machinery! If you are doing a new building, you may want to do a “ground breaking” when construction starts and a ribbon cutting when you open your doors. At SEDCO, we can help. Here are a few suggestions for hosting an event. Plan in Advance: Planning a month in advance is recommended for the largest turnout.,And don’t worry about coordinating the ribbon cutting with the exact date of opening – the ribbon cutting is symbolic – you can do it anytime.,Although our suggestion is do it within a month of opening. Develop an Invite: It’s helpful to develop a simple invitation that can be emailed to your customers, family and friends.,You can use a word template to put one together. Contact SEDCO if you would like some assistance – we usually keep some samples to give you ideas.,It’s always a nice idea to have a RSVP, particularly if you are having a more elaborate program and catering. Develop Guest List: Your guest list depends on circumstances – if you are a retailer or a service provider that depends on foot traffic – invite everyone.,If you are providing refreshments, then you may want to develop a more modest invite list.,SEDCO will work with you on the Town officials – We can forward your invite to the full list of Council, Department Heads and community groups like the Chamber and Buy Local.,Or you can decide you want to just hit some of these folks. It’s your celebration, you decide. Develop Program: The program can be as simple as a brief ribbon cutting during an open house (put the time of the Ribbon Cutting on the invitation. You could also do a more formal program where you have a series of speakers talk about virtues of the new/expanding business.,SEDCO will help with the program – including providing someone from the Town to speak on a program. It’s important for the Town to let you know how pleased we are to host your business – we’re happy to be a part of the program. In general, the program should be short – 10 to 15 minutes is usually fine.,There are occasions when a ceremony could last longer – you have visiting dignitaries from out of state or a number of partners in the project, but generally, a short program is good.,Don’t forget that you, as the business owner, needs to be on the program.,We usually suggest that the owner speaks last. Tell everyone why you opened the new facility, tell us a little about the company and take the time to thank your supporters – family, bankers, contractors etc. Tours: If it makes sense, invite folks to take a tour of the facility. Refreshments: Refreshments are optional, but it’s generally nice to provide some refreshments for the folks that attend. Coffee and donuts if it’s a morning opening or cookies and other drinks in the afternoon. If it’s a smaller group and you want to have a more lavish offering, absolutely, but it’s not necessary! Timing: Timing is always a challenge. At SEDCO we’ve found later afternoon to be a good time – starting at 4 or 4:30, with the Ribbon Cutting at 5. However, if that is the wrong time for your business, then absolutely schedule it at a different hour. For maximum attendance from the business community, we recommend Tuesday through Thursday. Implements: SEDCO has giant scissors – specifically for Ribbon Cuttings. We are happy to lend them to you. We often have extra ribbon, but our ribbon budget is low – so if you can find ribbon for the ceremony, that’s great. There are websites that specialize in the shovels, scissors and ribbons, but that can be expensive. Feel free to wing it with some good old fashioned Christmas velvet ribbon. If you are interested in the fancy materials – put “ribbon cutting supplies” in the web browser, and you will see several specialized websites. Press Release: Draft a press release – or work with SEDCO to draft a release. Send the press release out before the event. Then re-vise it after the event – to include new quotes from guests. Make sure to include a picture of the actual ribbon cutting and a list of the people in the photo. SEDCO maintains a list of press contacts on our website for you to download. Coordinate with SEDCO: SEDCO staff is here to help. It’s your grand-opening, so let your style show through, but call on us for advise, to borrow scissors, to help with a press release or get community leaders to the event. We’re so happy that you are doing business in Scarborough, that we want to help tell the world.